INDIA 5000 is a research group, initiated and organized by Benchmark Trust, which has created a platform by doing research and recognition for 5000 best MSME (Micro Small Medium Enterprises) in quality output. The INDIA 5000 Business Awards get initiated when we get nominations from businessmen and young entrepreneurs for their achievements. 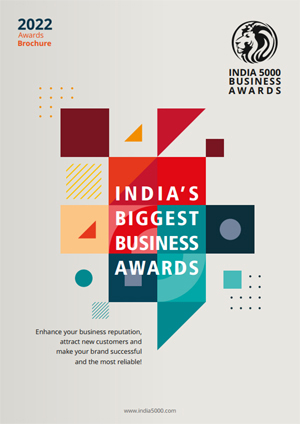 After getting all the details and based on certain quality parameters, INDIA 5000 nominates best 5000 MSME companies. These best 5000 MSME companies are selected for quality management, quality services or quality products. So, INDIA 5000 provides a platform to businessmen and entrepreneurs for Quality Excellence! What if MSME have quality in their work of production, services or Management? How their professional work gets recognized? Where they can get their listing as the best quality services, product or management? The solution of all these is INDIA 5000 Business Awards as INDIA 5000 is doing Recognition and Research to provide a platform for India’s 5000 Best MSME. INDIA 5000 would like to serve organizations and entrepreneurs for their professional advancements through research and recognition approach. INDIA 5000 wants to create a platform for organizations and entrepreneurs where the MSME businesses get recognition for their hard work.